Cleanliness in Hydraulic systems has received considerable attention recently. 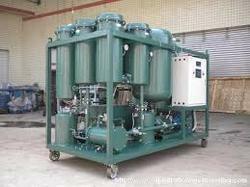 Hydraulic systems are extremely sensitive to contamination. Fluid cleanliness is of primary importance because contaminants can cause component malfunction, prevent proper valve seating, cause wear in components, and may increase the response time of servo valves and cylinders. 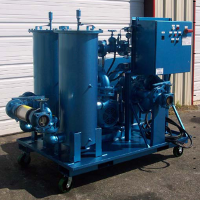 The inside of a Hydraulic system can only be kept and clean as the fluid added to it. 1.Chemically clean and treat internal surfaces of hydraulic lines. 2.Perform hot oil flushing to reach target cleanliness level. 3 Inspect and verify that the cleanliness level has been achieved. 4.Follow the proper steps when disassembling the flushing loops to prevent contaminants from re – entering the cleaned system. Seal off all openings with plugs, blind flanges and Plastic sheets. The object for acid carrying out cleaning of Hydraulic Pipelines is to remove mill scale, oil, paint, preservatives, rust, welding slag that would have entered during assembly of new tubes and also to remove the oxides of iron. After carrying out the process, the internal surface of the system is passivated by means of protective layer to prevent further rusting and corrosion. We provide unique oil flushing service, using oil-flushing skid developed to increase operating efficiency and reduce timescales. 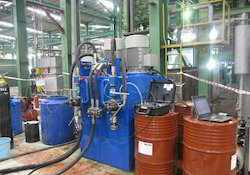 This equipment, and our team of experienced technicians, provides an effective and highly economical service onshore, offshore, overseas, for the rapid and effective clean up of lube, seal and hydraulic oil systems. Our equipment is compact, transportable, electrically driven and configured to work in hazardous areas. After setting the system up for a high velocity flush by removing all restrictions to flow, operational oil will be flushed through the system. This high volume of oil will remove scale and particulate from the piping and flush it back to the system where it will be filtered. Thermal shocks to the system will greatly enhance the cleaning process. Super Clean Oil is simply a by-product of this process. We provide on-site certification of contamination levels to NAS 1638 and ISO 4406 using on line laser particle counter. With the use of an On Line Laser Particle Counter, particle counts may be accomplished on site in a matter of minutes giving actual counts. All counts are based on particles per 100 ml, in various sizes (i.e.). 5-10 micron, 10-25 micron. A minimum of 100 ml of oil will be required for analysis. Entire oil system is cleaned and flushed. Oil system and oil becomes super clean. Reduced wear of lubricated parts. No extra flushing oil required. Oil system will retain natural protective oxides layer on the inner walls of the pipeline system. Significant reduction of filter cartridges consumption. Flushing Procedure involves circulation of clean fluid designed to remove preservatives, water, chemical contaminants, air and particulate matter resulting from construction, normal ingression, internal generation or component wear. Flushing involving high-pressure and high-flow of fluid circulation to generate physical movement of contaminants and removes them out. In order to meet these diverse requirements, we are providing a wide array of Industrial Pipe Flushing. Our professionals have depth knowledge in this domain, & render these flushing services with perfection in a given time frame. We execute these flushing services in an effective manner. Furthermore, these flushing services are offered at par with customer’s demands in a given budget. Keeping in mind the precise demands of our esteemed clients, we offer Lube Oil System Flushing. These flushing services are offered with the help of our professionals, who have vast experience of the domain and execute these in accordance with the market standards. We use high-tech tools and advanced techniques. Also, the flushing services offered by us are acclaimed for its reliability. Looking for Industrial Pipeline Flushing ?